Bali and the Maldives are both popular destinations for tourists who are longing for a tropical getaway. In fact, both places source out the majority of their economic growth from tourism. Most picture the classic sunny beach, coconut trees, and glistening shoreline when they hear these locations. Regarding their differences, Bali is a popular province of Indonesia while the Maldives is a likewise famous country in the Arabian Sea. The following discussions further delve into their distinctions. “Bali” came from the Sanskrit word, “Bebali” which means “offering” or “tribute”. The Balinese are known to have daily offerings to honor their God. This culture is evident from various temples which are also popular tourist destinations. Bali is Indonesia’s most sought-after haven for visitors. It is best known for its scenic beaches, volcanic mountains, ancient temples, rice paddies, meditation sanctuaries, perky bars, and artsy crafts. The province, which is also an island, plays an important role since its tourism-related businesses account for around 80% of the country’s economy. This sea temple is one of Bali’s most iconic sunset viewpoints. A scenic clifftop temple which is believed to shelter Bali from evil spirits. Most hikers begin before dawn to get rewarded by a magnificent sunrise-lit view. This revered active volcano boasts therapeutic hot springs as well as one of the province’s famous temples, Pura Ulun Danu Batur. Along with other prominent resorts such as Sanur, Jimbaran, and Padang-Padang, many surfers and sun-lovers revel in this resort’s tropical ambience. This art and culture locus is popularized by the book and movie, “Eat, Pray, Love”. One theory regarding Maldives’ etymology is based on the Sanskrit word, “maladvipa” which translates to “garland of islands”. This group of islands which is more formally referred to as the “Republic of Maldives” is situated southwest of Sri Lanka and India. It is known as the smallest Asian country which lies in the Arabian Sea. As of November 17, 2018, the president of the Maldives has been Ibrahim Mohamed Solih. 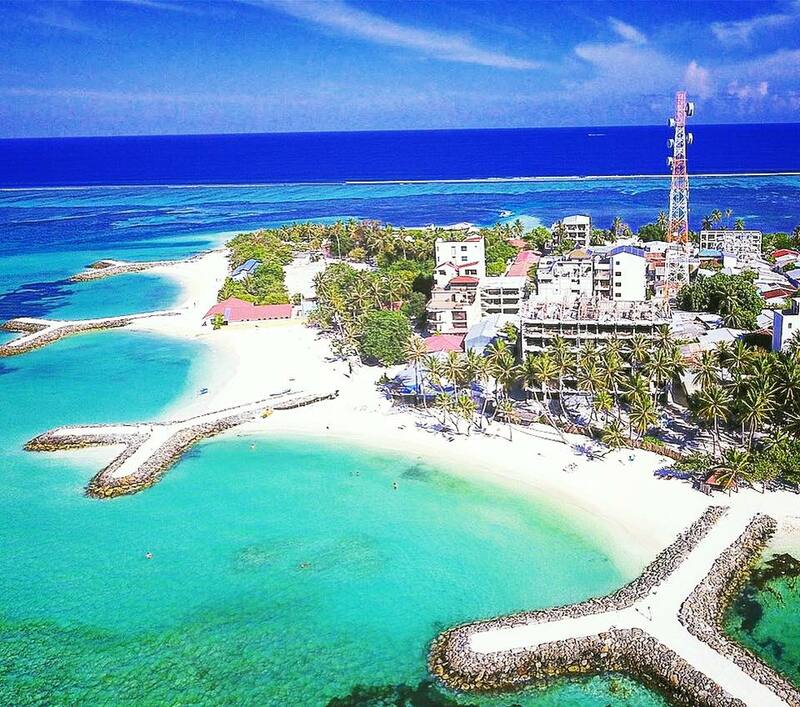 The capital city is Male which is traditionally known as the “King’s Island”. It is famous for its breathtaking corals, watersports, and crafty boutiques. Right next to the international airport, the capital showcases a variety of R ‘n R sites such as the whale submarine, artificial beach, national museum, notable restaurants, and underwater scooter rides. This paradise is elegantly equipped with 5-star-amenities which is perfect for the ideal getaway. This internationally renowned diving site is shaped like a banana which is awesome for snorkeling, scuba diving, and other adventures. This is the oldest Friday Mosque in the Maldives which is an important architecture in Islam history. Bali is a province of Indonesia while the Maldives is a country in the Arabian Sea. Most of the famous destinations in Bali are temples which relate to the province’s etymology which means “offering”. On the other hand, most of the tourist spots in the Maldives are islands or resorts which resonates the name, “garland of islands”. Most of the beaches in Bali have golden or black sand since it is a volcanic region. On the contrary, most of the beaches in the Maldives are picture-perfect white. Bali has more religious architectures specifically temples which are influenced by the province’s predominant religion, Balinese Hinduism. As for the Maldives which is a strictly Islam country, it is known for the historical Male Friday Mosque. Trekkers would prefer Bali over the Maldives as there are more mountain trails such as Mount Batur, Mount Agung, West Bali National Parks, and Campuhan Ridge. On the other hand, the Maldives is the world’s lowest country and its typical elevation is only four feet above sea level. For swimming-related activities, the Maldives would offer more avenues since it is 99% water and its remaining 1% land is made up of more than 1,000 coral islands. Hence, the Maldives is also ideal for scuba diving, snorkeling, and under-water walking. As for Bali’s beaches, many of them are more popular for their big waves as evidenced by its 33 surfing locations. 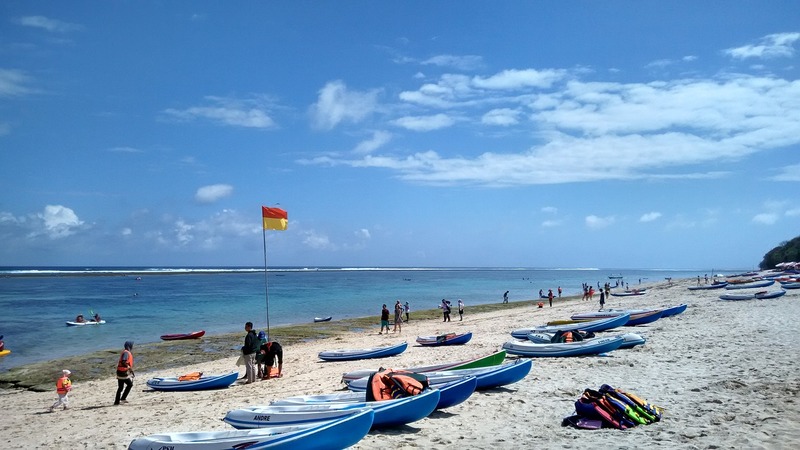 As of October 2017, Bali entertained as many as five million visitors and its Tourism Ministry is even aiming to attract 7 million foreign tourists in 2018 and 8 million in 2019. However, the statistics for the Maldives is humbler at 1.3 million tourists in 2017. The figure did not significantly vary in 2018 and the less number of visitors is most likely attributed to the political unrest and other safety-pertinent reasons. Bali and Maldives are both popular destinations for tourists who are longing for a tropical getaway. “Bali” came from the Sanskrit word, “Bebali” which means “offering” or “tribute”. One theory regarding Maldives’ etymology is based on the Sanskrit word, “maladvipa” which translates to “garland of islands”. Bali is a province of Indonesia while the Maldives is a country in Asia. The most frequent tourist destination in Bali are temples while those in the Maldives are islands. There are more white sand beaches in the Maldives than in Bali. Unlike in Bali, there are less or no hiking avenues in the Maldives. As compared to Bali, there are more avenues for swimming-related activities in the Maldives. There are more tourists in Bali than in the Maldives. gene balinggan. 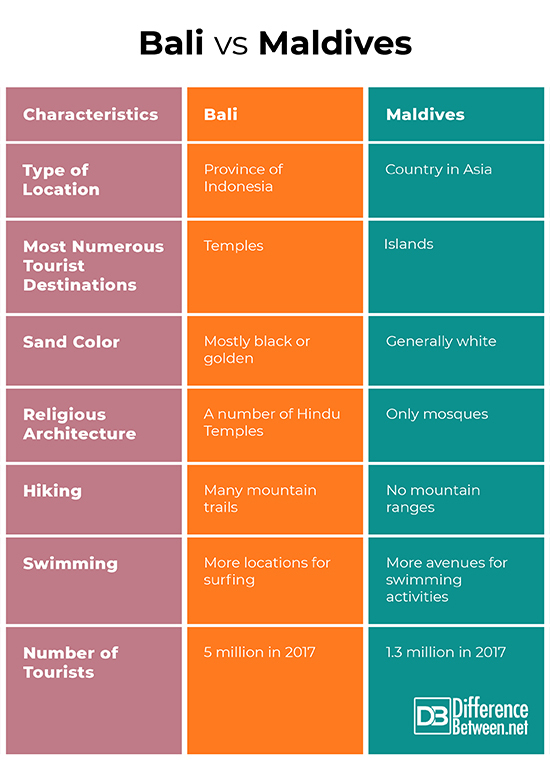 "Difference Between Bali and the Maldives ." DifferenceBetween.net. January 29, 2019 < http://www.differencebetween.net/miscellaneous/politics/difference-between-bali-and-the-maldives/ >. Masters, Tom. Maldives. Victoria: Lonely Planet, 2015. Print. Robinson, JJ. The Maldives: Islamic Republic, Tropical Autocracy. London: C. Hurst & Co., 2016. Print. Sharp, Roger. Surf Travel the Complete Guide. Victoria: Orca Publications, 2018. Print.